Traveling the world is an amazing experience, but let’s be honest. The actual “traveling from A to B” well, that can be less than luxurious when you have kids in tow. So, what are families to do? What are the simpler/ better ways to travel with kids? Well I have tried my fair share of methods be it plane, boat, car and train. And, I have to say there is no method as relaxing as a train ride. We went from D.C. to New York on Amtrak with kids (5 of them) and the experience was amazing. When is the last time you boarded a train? For us it was a completely new experience when we took a train ride in Europe. After realizing what a simple and relaxing way to travel it was we vowed to use trains when we got back home to the states. I am so glad we did. Our train ride with Amtrak from Washington DC to New York was not only easy and relaxing… more importantly it was fun!! Making it an incredible family memory. Here is why I think you should start looking at taking Amtrak on your next family trip. I am so thankful for all of the security measures our country takes to keep us safe. But, taking 5 kids through the security check at an airport is one of my most hated adventures. Shoes off, laptops in a separate bin, fold the stroller, where’s the carseat- ahhhhh!!!!!! So, you can imagine my sheer delight when I realized what a simple process it was to board the train. Easy peasy!! Yes, you read that right! Amtrak has complimentary wifi on their trains so you can stay connected throughout your journey. My kids loved being able to play games on their ipad, my husband liked being able to catch up on some work and I enjoyed relaxing while everyone else was entertained. You will also be happy to know there are plenty of electrical outlets available at your seat making it even easier to stay powered up and connected! Who wants to wait for the snack cart to come down the aisle of the plane? Even when it does come it likely doesn’t have much on it these days anyways. But, when you are traveling on Amtrak with kids, your kids don’t have to wait, Amtrak has a snack car open for your dining pleasure throughout the train ride. Longer distances even have full dining cars. In our snack car we found pizza, nachos, sandwiches, fresh fruit, candy, hot cocoa, coffee & more!!! There was even a nice selection of beer, wine & cocktails for the grown ups. Plus, the kids will think it is an amazing adventure to walk through the train cars to get their snacks too! Trust me… it was one of the highlights of our kids trip. My daughter said she felt like she was on the Polar Express!! One of my personal favorite thing about traveling on Amtrak with kids is the amazing views you get right outside your windows. Train tracks weave in and out of towns, mountains, and coastal areas. They go places cars can’t take you and since you are on the ground (unlike being in the air) you can actually see where you are going. When it comes to traveling with kids one word makes it all worth it- FUN! Finding ways to make travel fun is key and Amtrak has no shortage of ways to make sure your kids have fun that’s for sure! Whether its the fact that there are table in the cars ready to play board games on, having wifi access so kids can play all of their apps, snacks available the entire train ride or just being able to get up and walk around on board. These simple pleasures kept smiles on our faces the entire train ride. Although, we didn’t need the additional amenities available on board Amtrak this time (our ride was only a few hours long) it is nice to know they exist. If you plan on an overnight or extended/ lengthy train ride you will be happy to know there are sleep & dining cars available. There are a variety of bedroom configurations on the Superliner and the Viewliner trains that you can check out, including the Family Bedroom here. Meals are also included for “Sleeper Service” passengers so you receive all regular meals as part of your package. Other amenities include fresh linen & towel service and complimentary bottled water. You also receive access to Club Acela and Amtrak Metropolitan Lounges during your ride. On long distance trains, full dining cars are available featuring hot and cold meals prepared by a team of award-winning chefs. The dining options vary by train and can be viewed in detail on Amtrak’s website here. Just make sure to book your reservations early to avoid long waits. You can check out Ella’s thoughts on her Amtrak experience and get a kids point of view over on Amtrak’s blog here. Amtrak travels to over 500 destinations reaching across 46 states plus some areas of Canada as well. To learn more about Amtrak’s routes and services you can visit them on their website, check them out on Facebook, Twitter & Instagram too. *A special thanks to Amtrak for hosting the munchkins on our train ride from Washington DC to New York. As always, my thoughts and opinions are 100% my own! We had a blast playing cards and board games in the lounge car. 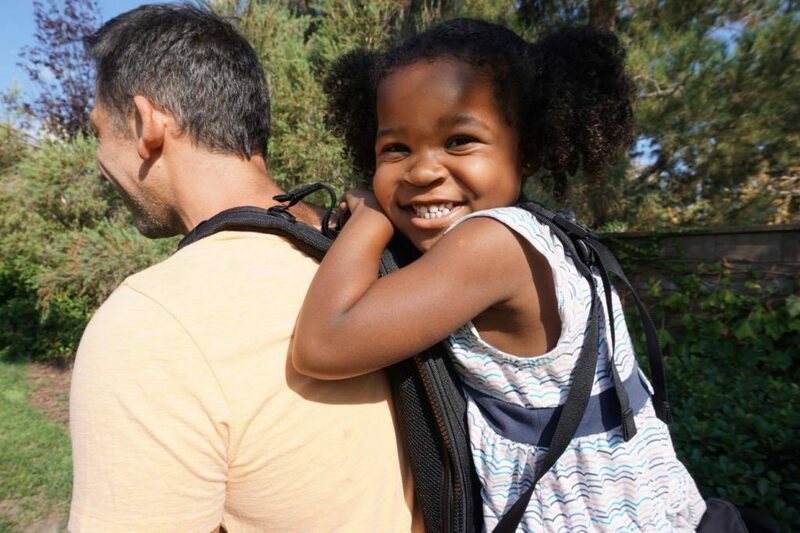 Finally… a Toddler Carrier that Works!